Ford has struggled with an aging model lineup and a contracting market in the UK, Ford’s biggest in Europe, which is in store for further disruption from Brexit. In a statement on Thursday Ford said it will seek to exit the multivan segment, review its operations in Russia, and combine the headquarters of Ford UK and Ford Credit to a site in Dunton, Essex. "We are looking to make a step-change in the performance of the business," said Steve Armstrong, Ford’s head of Europe. “There will be significant impact across the region. We will be looking at all options,” which could include plant closures, he said. Any layoffs and plant closures at Ford would be subject to the outcome of formal negotiations with labor representatives, Armstrong said, adding that he hoped that job cuts could be achieved by "voluntary means." He declined to quantify the scale of job cuts, pending negotiations with labor leaders, but said staff reductions would run into the "thousands." Ford announced in December that it was working on a restructuring plan for Europe called Sprint to 6 Reset and Redesign. The name refers to Ford’s 6 percent profit margin target for Europe. The company did not give a time frame for the target. Ford has already said it will cease production at a plant in Bordeaux, France and has started labor talks at its Saarlouis factory in Germany where 6,190 staff build cars as it considers ending production of the C-Max compact van. 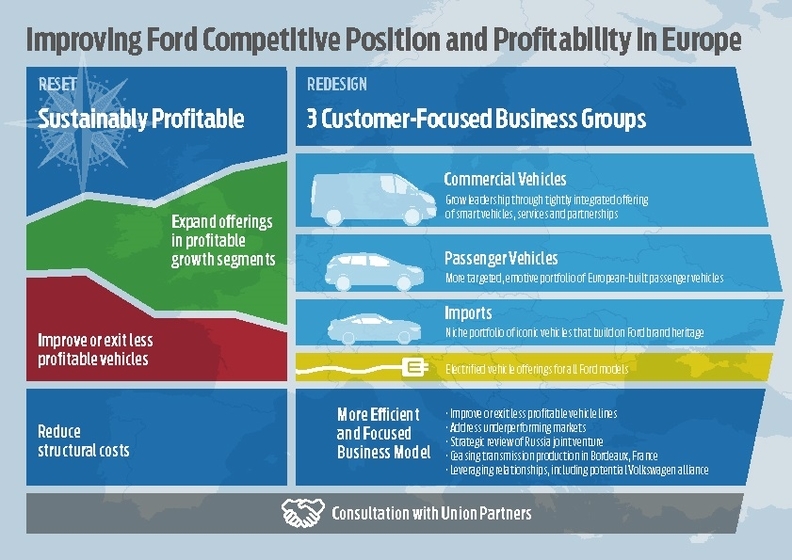 Ford said on Thursday that it also plans to leverage relationships, "including a potential alliance with Volkswagen, to support commercial vehicle growth." Ford and VW could announce details of an alliance on Tuesday at the Detroit auto show. The automaker, which currently employs 53,000 people in Europe, has struggled to turn a profit, posting a 245 million euros ($282 million) loss before interest and taxes in the third quarter, widening from $192 million a year earlier, and equivalent to a negative 3.3 percent EBIT margin. Ford’s European business currently relies on models such as the recently revamped Fiesta and Focus hatchbacks. Ford last year kicked off a company-wide $11 billion restructuring after both Europe and Asia swung to losses and costs to invest in electric and self-driving vehicles mount. Like many other carmakers, Ford has warned it won’t meet its forecasts for 2018, and CEO Jim Hackett jettisoned a goal to reach an 8 percent profit margin by 2020.